There is much confusion concerning terminology with regard to microlights. Different aviation authorities have different names and different regulations for these flying machines.In the UK we refer to these flying machines as microlights in their two basic design forms - 3 axis and weight shift. Microlights originally evolved from hang gliders and were initially simple airframes controlled by weight shift. Such machines are still available and still flown today. They closely resemble a hang glider in construction with the addition of the passenger and engine carrying pod underneath. It is worth mentioning that the sport of hang gliding developed as a direct consequence of the NASA programme for manned space flight in the 1950s and 1960s. The delta wing that we associate with hang gliders and weight shift microlights were devised as a way of returning the space capsule safely to earth. In fact the method was discarded by NASA but adopted by others. The pilot, and passenger if carried, of these weight shift microlights need to be suitably attired as they are not protected by a cabin. Crash helmets need to be worn with visor protection as there is no windshield. The performance of these machines is impressive in the short take off roll required and the rate of climb achieved but the overall speed and endurance once airborne is not so good. Microlights are often unfairly thought to have a poor safety record. Certainly early airframes were not robust and because of their overall weight, microlights were exempt from a lot of the CAA maintenance and licensing requirements. However, statistics reveal that they do in fact have a better safety record than many other general aviation sectors. 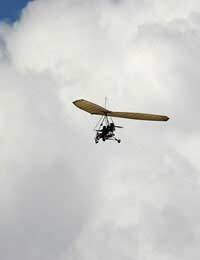 There are more microlights on the general aviation register maintained by the CAA than any other category of general aviation aircraft - it is a popular past-time. Pilots of microlights tend to be genuine enthusiasts who care about safety. A lot of general aviation pilots who can longer maintain a class 2 medical go on to fly microlights as the medical requirements are not as stringent. Others fly microlights because of the lower associated costs than fixed wing or rotary aviation. Some fly microlights simply because they are such enthusiasts. It was not until the 1980s that the 3 axis machine appeared - these closely resemble a light aircraft and have lost their resemblance to the hang gliders that started it all. Many of these machines are capable of speeds and endurance comparable to, if not better than, a light aircraft and as a result are becoming more popular with the general aviation community. The pilot licensing requirements for a microlight are different from those required for a PPL (A) or PPL (H). To legally fly a microlight solo and unsupervised the pilot must have a valid PPL (A) Microlight, which includes a Declaration of Fitness. There are fewer ground examinations to take and there is a simple oral test about the aircraft type. To obtain a licence a total of 25 hours microlight flying must be logged - 15 hours dual and 10 hours solo. There is a general flight test and two qualifying cross country flights to complete.